"You started with a Brittany?!?" This is a topic I'll likely address more than once: what makes Brittanys so special as a breed. Our boy has many peculiarities and quirks that specifically endear him to us that aren't necessarily generalizable to the breed. But, we've often been astonished that many of his lovable, clownish behaviors and wonderfully diverse facial expressions seem to be traits that other Brittanys we've met share. At the same time, these amazing dogs manage to be at turns regal, goofy, serious, amped-up, high prey-drive hunting dogs, super-affectionate and loving companions, complete nut-balls, stubborn and yet easily hurt in the feelings department. Such a range of personality and qualities probably overlap with a lot of other bird dog breeds (my favorite category of dog), but for my money Brittanys are simply the best and I'll say that with complete confidence despite being a beginner in all things dogs - I just refuse to admit that it could be possible for other dog breeds to be as awesome as these little pocket rocket bird dogs. I'm sure other breed partisans can make pretty compelling cases for their dogs and love theirs just as much, and would also say their dogs are the best. Difference is, they're wrong, but they're entitled to their incorrect opinion. Haha, I kid, I kid (Not really)! One of the things that inspires my hubris-by-association is the reaction we get from complete strangers when we are out with Lincoln. Probably one of the most common reactions is "What kind of dog is that?! He's gorgeous!" (or perhaps even more frequent, "SHE'S beautiful!" - It's tough to be a badass hunting dog boy and look as good as he does). We understand that reaction. We were exactly those people over a year ago when we first started thinking about getting a dog and started noticing Brittanys in particular here and there. Another common reaction has happened more than once recently with kids. "Oh, I want to get a dog like that!" A mother instantly replies with, "But, you don't even like dogs!" "I didn't say I like dogs, I like THIS dog!" or "THIS is my kind of dog! What is it?" We understand that too. We're still those people. Then we get the reactions from people who know exactly what kind of dogs Britts are because they had one or have one. "Gorgeous Britt!" always puffs us up a little and makes our hearts leap with pride in our boy. We've had several older gentlemen stop us on the street and regale us with tales of childhood Brittanys they knew and loved, in their own homes, or in a beloved uncle's or their grandparents' house. One dude even cried right there in front of us. And we certainly understand that - we'll most definitely be those people one day. Of all the joyful reactions we get, we probably enjoy that last category the most as we love talking shop with folks who love this breed like we do. But, it's never far into the conversation when our status as first-time dog owners comes up and someone invariably stops cold with "Wait! You started with a Brittany?!?" This surprised us a little the first few times we were hit with it. Yeah, so? Puppies are all nuts. What's different about a Brittany pup? We were horribly offended early on in a local dog training facility with a very large puppy training class when Lincoln rocked a response to a class command and the instructor, a lab owner, stopped to point out to the class, "but you guys don't understand, this is amazingly good for a Brittany!" Fearing our boy had just been disparaged by a breedist, we vowed then to find another training facility with (very much to her point!) fewer dogs to distract a highly energetic and highly social Brittany pup. We did, and, even if we eventually forgave that instructor - understanding what she was probably trying to say - we found exactly the right place and small-size class setting for him where an instructor could work more one-on-one with us and in which his natural intelligence was allowed to shine in an environment which didn't overstimulate his vast reserves of Brittany energy. High energy ... except when he's "no energy" ... luckily for us, that's every morning. He saves the zoomies for evenings. This is probably a good descriptor of all bird dogs: high energy! But it is very applicable to Britts. It's the first thing you'll hear about them if you tell someone you're thinking of getting a Brittany - and it's good information. Listen to it carefully and seriously consider it. All bird dogs are bred to greater or lesser degrees to be indefatigable in the field. The expression "bird-dogging it" is pretty on-point when describing any action that is both meticulous and relentless. An accountant or auditor bird-dogging expense reports is someone who isn't going to miss a critical error or red flag for graft because they won't stop until they find it. A programmer bird-dogging a program is someone who will check every single line of code until they find the single mistyped character that broke it. A human with that sort of meticulous diligence is one necessarily one with high energy and drive in whatever their realm of activity. A bird dog is even more so. And a Brittany is the more so of bird dogs. And with that wonderful, very task-appropriate trait comes the consequence that they can be a handful if you're not prepared to give them daily opportunities to expend all that energy. Surely it's not for everyone, but, for us, taking the gamble on a high-energy breed was exactly the right way to go. We didn't have memories or expectations of a calmer dog breed to which to constantly compare our boy, so we just rolled with it. Through occasional stressful growth periods, we adapted because we just thought this is what having a puppy was all about - we didn't know any better that not everyone had to figure out ways to stop an out of control pup zooming endlessly around a table or had to find two or three doggie friends to tag team him because he would successively wear each one out playing. We had no idea, that's just what puppies do, right? Well, yes and no. Yes they do, but none to our eye quite as much as a Brittany pup. And, I think there's a fair-to-middling chance that being hit out of the gate with his energy and energy expenditure needs has made us better-than-average owners and has made him as a result a better-than-average behaved dog than many we've encountered this year - but certainly not all - we still have plenty of role model people and dogs who set a higher standard that inspire us and stretch us past where we are, but I'd say super eager first-timers paired with a Britt can definitely equal a pretty damn good brag dog. If you were to spend a week with us and ignore his being-a-pip days and only remember his rock-star days, we know you'd agree! Many of our unpublished pics of Lincoln look like this as photographing him often involves what feels like capturing a creature in constant motion. 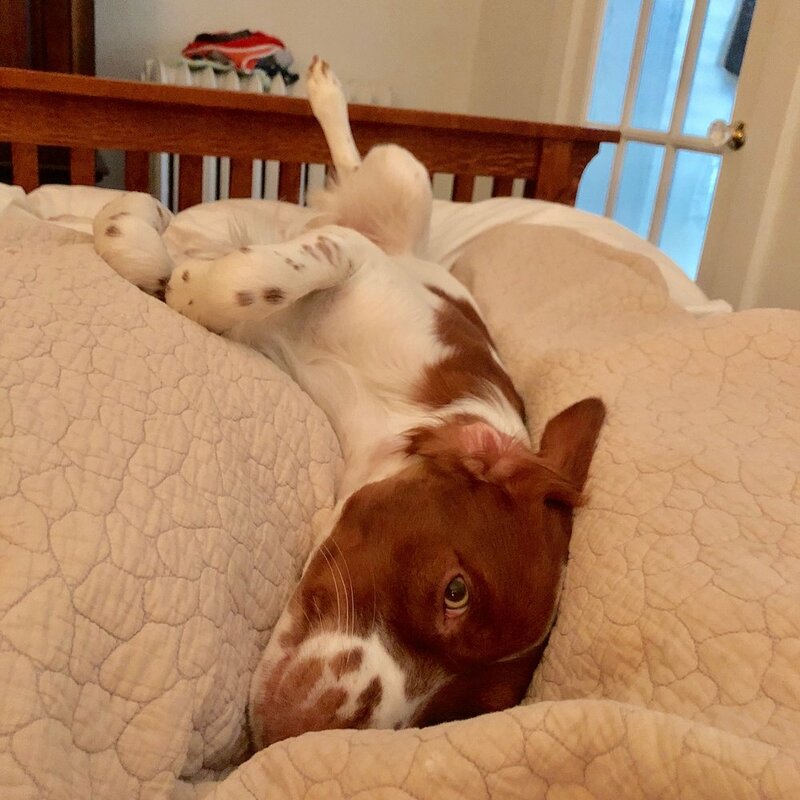 The best part for me of starting with a Brittany is that he's added significant force to my awesome spouse's lifetime work in absolutely compelling me to want to be a better man. While I don't always show it to any who don't know me very well, like many guys, I am easily frustrated by or disappointed in others. With a wound up little Brittany pup this past year, I've learned more quickly and effectively than ever before (and almost miraculously) to consciously and habitually ease up and readily forgive imperfections (the same sort I hope will always be forgiven in myself - and I have an abundance) and never ever (never ever ever) give in to frustration by yelling at him in anger. Especially with this wonderful breed, you quickly learn the greater effectiveness of positive reinforcement training techniques. Really, trust me, they are more effective - so says the science and research and my direct experience. While aversive training techniques have some appropriate uses (see snake-breaking and one or two other arguable bird dog / hunting dog situations), in almost all cases positive reinforcement techniques are the clear winners in getting dogs to learn and to do so quite willingly and therefore more effectively and quickly. Dogs, for whatever reason, perhaps because they are a socially acceptable outlet for a richer masculine emotional range than just a variety of stoic, taciturn postures to anger and rage, are a catalyst to the best parts of a man. I've seen it over and over: guys who you'd normally think of as brick walls emotionally, breaking down and crying over their dogs, still with them or deceased. Maybe it’s because they’ve evolved with us to be just enough like us to elicit a very familiar, bonding love without being too much like us to trigger the more negatively complex dynamics of human relationships. But, however they do it, with the right people and the right dogs and in the right circumstances, these perfectly innocent creatures can just somehow break through all of our crap and bring out the very best of what we can be. And so it is with me. My spouse and family and best friends have always done that for me - brought out wonderful emotional complexity that is surprising sometimes to feel - but Lincoln does that for me in spades in ways unique to the bond between human and canine. He challenges me every day to be my best and he richly rewards me for it. Sometimes, I feel like I get flashes of the hidden truth that he's a secret Bodhisattva, with clicker and treat in his paws, giving me a click and a "good boy!" when I manage to do the exact right thing with him. Our boy constantly invites us to go outside exploring with him. And who could resist? So, yeah, I started with a Brittany. And it's made me a better dog-owner, a better man, and a better human being. Out of love for him, I will always strive to be the man my dog thinks I am. If you find you're falling in love with this breed (or any bird dog breed, really) like we have, I can really think of no better recommendation for these high-energy, badass-loveable dogs than that.